Voyager Spacecraft - Solar System Planets And Moons Section. Voyager spacecraft and Hubble Space Telescope. Voyager spacecraft and the Hubble Space Telescope. 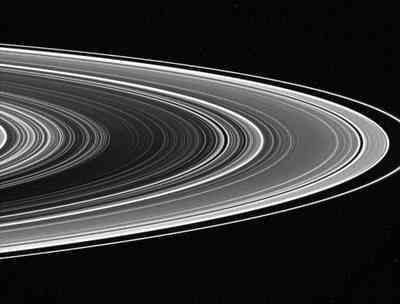 In this extreme contrast view of Saturn's rings, has been created by NASA in order to search for spokes. These are ghostly lanes of dust that NASA's Voyager spacecraft and the Hubble Space Telescope have seen in the past - so far, though, Cassini has failed to get a picture of them. The spokes are probably invisible because the Sun's angle to the rings is relatively high. As Saturn's summer in the southern hemisphere moves into autumn, the spokes should become visible again. Aug 31, 2005 After examining more than 4,000 Galaxies in a recent survey, Astronomers have discovered that most large Galaxies are filled with old stars, It was expected that these large Galaxies would be regularly ingesting smaller galaxies, creating bursts of star formation. Instead, however, it's the smaller, fainter Galaxies which seem to have all the hot star formation. The large, red Galaxies contain the bulk of the mass in the nearby Universe, but very little is understood about their formation or evolution. Cracked Features on Enceladus Are Very Young. NASA's Cassini spacecraft has discovered that the long cracks discovered on the surface of Saturn's Moon Enceladus are actually quite young, between 10 and 1,000 years old. These findings support a previous discovery that Enceladus has a very active geology, and its surface features have been changing quite recently. These cracks act like vents, allowing ice and vapour to spew out. The fact that Enceladus is so active came as a surprise to scientists, as it's hard for an object this small to hold onto its heat.